Our attractive locking aluminum attache case features the Budweiser Crown medallion on top. 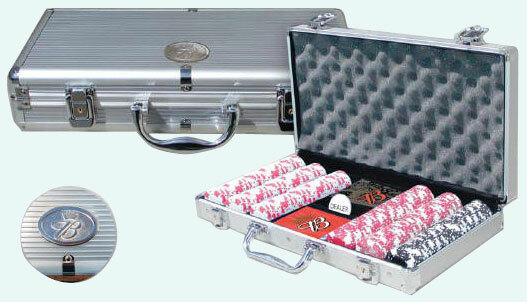 Set includes 300 Las Vegas Style 11.5 gram clay composite chips with metal inserts. Chips are assorted 150 red & white, 100 white & red and 50 black & white. Also includes 1 dealer button, 2 decks of Budweiser plastic coated playing cards and two lock keys. This unbreakable 11.5 gram composite chip with a metal insert is stronger and heavier than a Las Vegas chip. This casino style chip is gold stamped with Budweiser on one side and the B and crown logo on the other side.